I’ve had a massive urge for some time now to attempt a black bream on a surface fly. 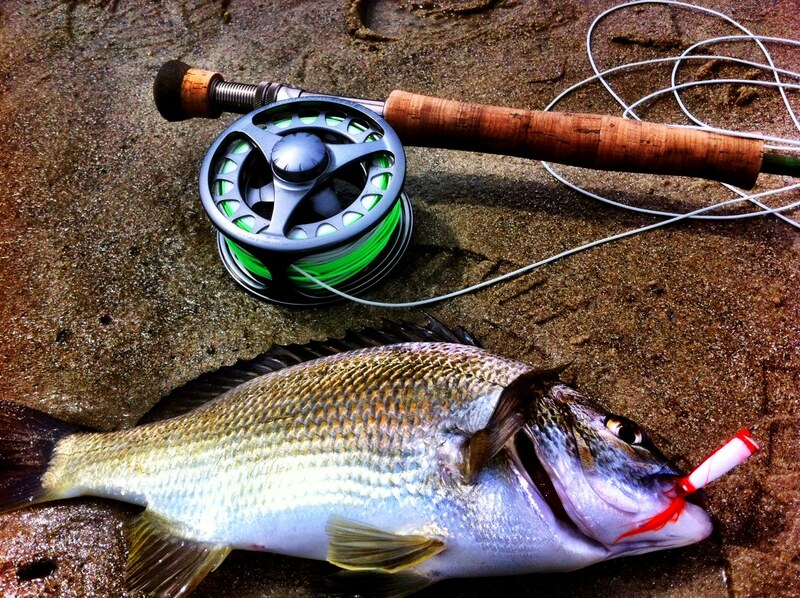 I’ve only caught a few bream on fly before but I never really target them enough on the long wand. Anyway, I whipped up a few popper-styled flies about a year ago and I’ve only been out once to use them – That was pretty much in winter when the bream are often tough as a surface prospect! 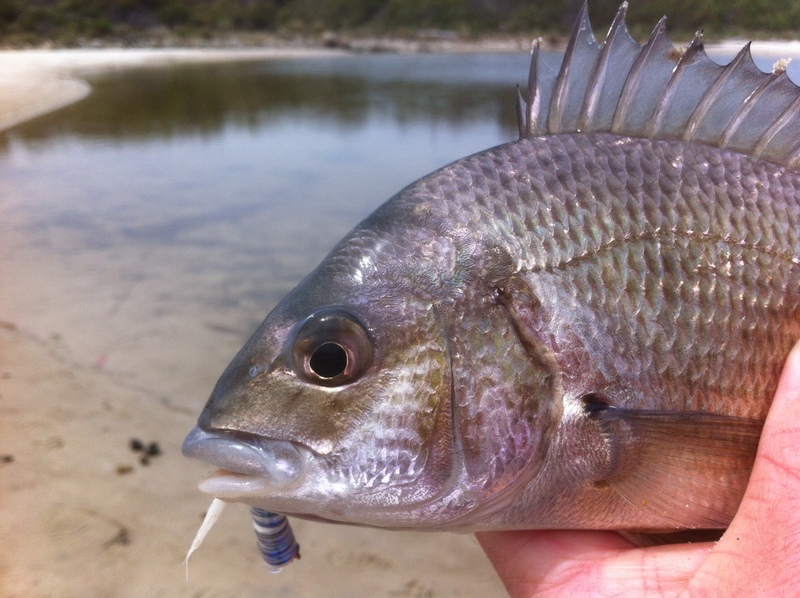 So I found myself with some time up my sleeve while on the East coast of Tasmania, where the bream populations thrive but are by no means an easy feat. The day was warm and there was just enough wind about to hide the slap-downs of a few sloppy casts. 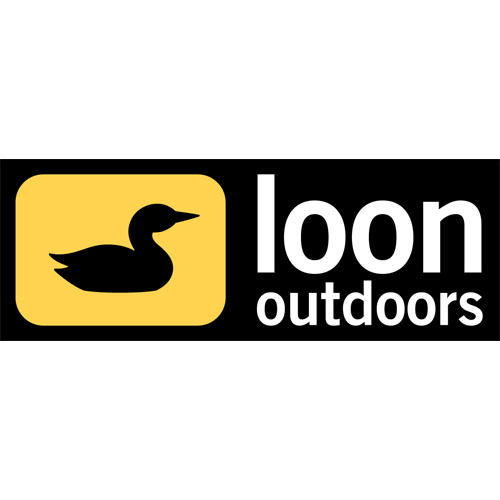 I started rigging up and selected a wet fly and had almost completed my knot bar trimming the tag when I heard a distinctive slurrrrrp up against the tussocks. A few rings floated out from the bank and I knew that a bream had just smacked something on or near the surface. The wet fly was promptly severed from my fly line and on went one of these popper flies. I wanted to have a look where this fish was hanging out so I gained a slightly higher vantage point some distance away and polarioded around six bream against the tussocks in the shallows. Hell yes. I skipped back to an ideal casting location and flipped my fly a couple of feet out from the bank and immediately gave it a couple of quick twitches and paused……BOOF!! What a response! I missed the fish and pulled the hooks clean out its mouth. The next few casts drew fish out too and the were boiling on my fly as I retrieved, mostly on the pause. I waited for a few minutes so as not to spook them and cast again. BOOF!! Nope, missed him. A couple of quick twitches…. BOOF!! This time he’s on! Woo hoo, it had finally happened after many sleepless nights envisaging that exact moment. Stoked off my nut I continued on of course, with pretty much the next twenty or so casts drawing some sort of response like a fish landed, missed, boiling or boofing my fly! They were on the chew and so was I – Chomping at the bit for each bit of action. I explored different sections of water including drowned timber, tussocks, sand flats and rocks and all had feeding fish on them. At one stage, a couple of seagulls flew over and startled a big school of fish over a flat, giving their location away. They seemed to spook when I cast my fly fair in the guts of them but an aggressive ‘bloop, bloop, bloop, pause’ nailed me two fish in quick succession! I also watched as several smaller bream bow-waved after my fly so I kept stripping quite fast until one of them smashed it on the move. Epic! You may notice in a couple of photos that my fly started out an orange(ish) sort of colour with black stripes, but as the fish kept smashing it the epoxy coating wore off exposing bare foam body and marabou tail. Funnily enough they kept eating it! Still, I changed to a silvery baitfish pattern with a white tail that I’d tied, which also drew great results. 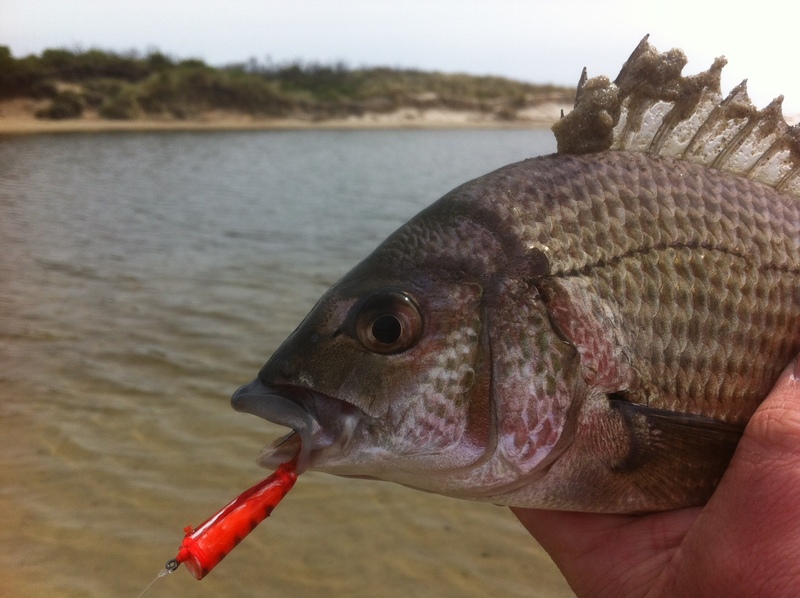 They certainly weren’t the monster black bream that Tassie is known for but with the biggest at around 34cm and the smallest at 28cm they pulled well. 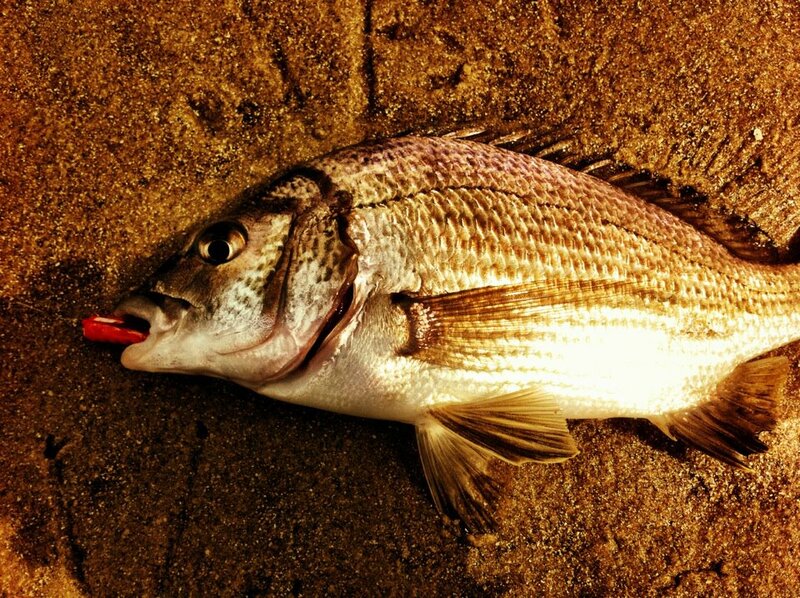 I can’t wait to get back down for another lash for a big blue-nosed black bream!